New Delhi, March 3: Wing Commander Abhinandan Varthaman, who returned to a hero's welcome on Friday night, became the toast of the nation overnight. After his return from Pakistan via the Attari-Wagah border late on Friday night, the Indian Air Force (IAF) pilot underwent a series of medical tests. According to a report by Economic Times, the pilot returned home with a rib fracture, back contusion (bruise on lower back) and some bruises on the face, head and hands. The report further adds that the injuries came to light during his medical checkup at the army’s Research and Referral (R&R) hospital in Delhi. The hospital confirmed that the IAF pilot did not suffer any 'significant' injury. IAF Wing Commander Abhinandan Varthaman's Return Hailed by PM Narendra Modi. Sources told news agency ANI that the scan has also shown that there is an injury in the pilot's lower spine which could have happened due to his ejection from his MiG-21 after aerial engagement with an F-16. Also, he will undergo more check ups and treatment at Research and Referral Hospital in Delhi Cantonment. During his medical checkup, the IAF pilot also underwent a MRI scan at the hospital, which confirmed that he didn’t suffer spinal and brain injuries. However, the pilot has been admitted at the hospital and is under observation for a fractured rib and is believed to be discharged on Tuesday. Doctors treating him were quoted by ET saying that he has got a few bruises on his eye and face. The Air Vice Marshal said the medical check-up is necessitated as the Wing Commander had to eject himself from a crashed flight on Wednesday, which would have severely stressed his body. Abhinandan Varthaman Returns India After 58 Hours From Pakistan Via Attari Wagah Border. Varthaman was held captive in Pakistan for two days after his plane crashed on the other side of LoC while on a mission. Reports inform that Abhinandan's MiG-21 jet crashed during the aerial operation. The IAF pilot was handed over by Pakistan to a team of the Indian Air Force at the Wagah-Attari border crossing between at 9.22 pm on Friday. 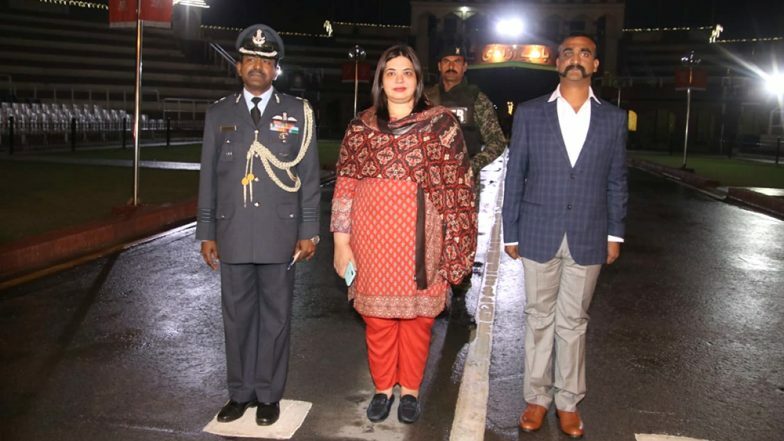 On his arrival, Abhinandan, dressed in a suit, walked at the Attari-Wagah border and was accompanied by Group Captain J T Kurien, Air Advisor in the Indian High Commission, and Fareeha Bugti, Director (India) in the Pakistan Foreign Office. Abhinandan Varthaman Remains in High Spirit Despite Mental Harassment in Pakistan. Soon after his release, the Pakistani foreign ministry issued a press release claiming that the pilot was “treated with dignity and in line with international law”. However, on Saturday, the Indian Air Force pilot gave Sitharaman the details about his nearly 60-hour stay in Pakistan. Describing his ordeal there, Varthaman told Sitharaman that he was subjected to mental harassment during his nearly 60-hour captivity in Pakistan.